This week I’d like to introduce you all to Dotti. She’s recently joined the OWH Blog Team and will be working behind the scenes at OWH on the Board of Directors too. Dotti’s told me that she spends way too much time looking at all the great cards on other peoples blogs to have time to keep up her own blog! (I know that feeling!) Be sure to leave a hello in the comments section of this post for her. How long have you been stamping? Since 2000, when my hubby gave me a birthday gift of a Basic Stamping class at a local stamp store. Wow, I was immediately hooked! What are your favorite stamp/craft products? I love my Cuddlebug with the dies and embossing folders. I also love embellishments and ribbon and all kinds of paper…LOTS of paper! Do you have a favorite technique? I love learning new techniques because I get bored doing the same thing over and over! I really like dry and heat embossing though – love the depth that it creates. So, I guess, I like anything that “pops” off the card and gives it some dimension! I also like different textures on cards, like fabric, ribbon and specialty papers. How did you hear about Operation Write Home? 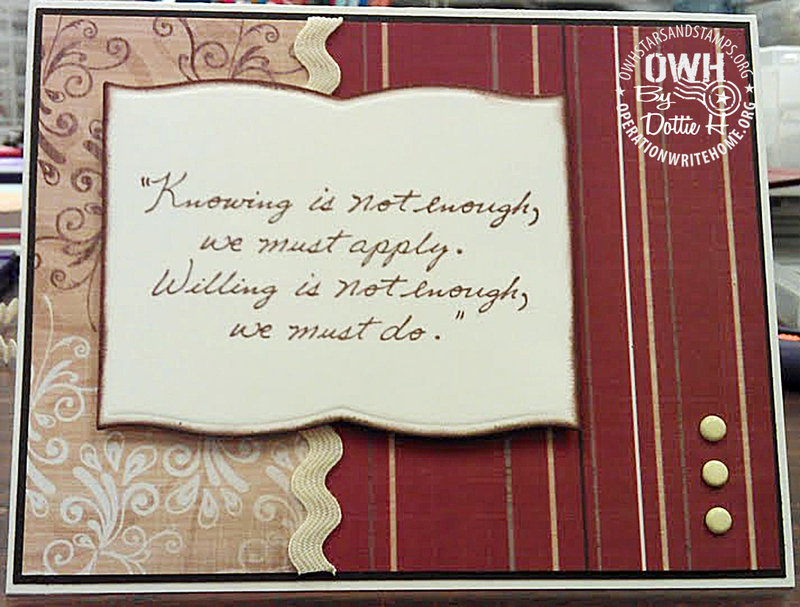 A friend invited me to an OWH Card Making party at a Federal Way scrapbook store that Sandy hosted in June 2011. We stayed the entire day and I just loved it…the mission of OWH captured my heart. What motivates you to make cards for our heroes? I have a passion for encouraging people to use their gifts and talents to serve others. One of the ways I love to do this is by making cards to encourage people, and have wanted to find a way to impact others with this gift for years. I was so excited to have found OWH with an organized way to support and encourage our troops to stay connected with their families using handmade cards! I knew right away that this was the opportunity to serve others that had been on my heart for so long (I just didn’t have any idea of how to accomplish it!). I am blessed by the opportunity to make a difference in the lives of our heroes and their families by serving them through OWH! Dottie, All of your cards are just beautiful but that first one is striking. I totally love it. I would have to say that one is my favorite. Anyone will be lucky to receive any card that you make, that's for sure. 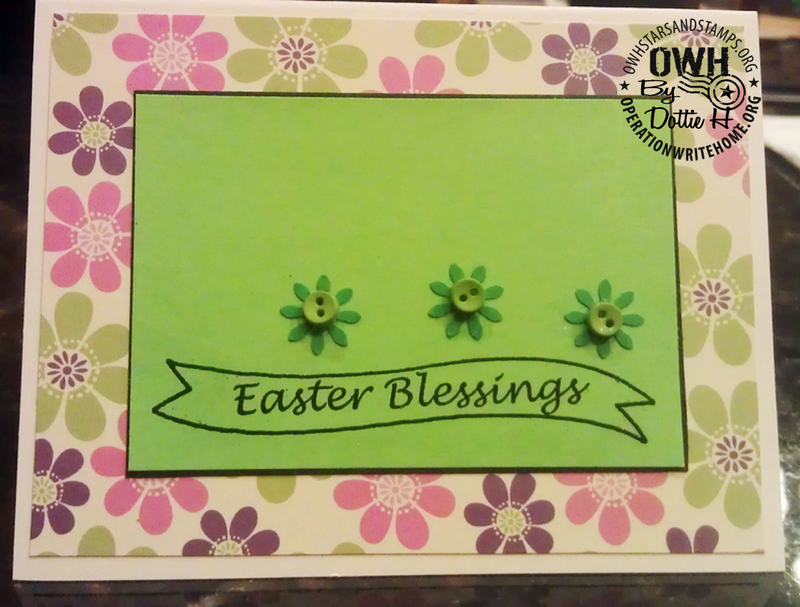 Thanks for sharing your cards with us and also for joining OWH. Great cards! Love them all, and the car card really pops! Thanks for your support! Dotti, great cards! The very last one is my fave. 🙂 welcome to the owh team!! Dotti – what gorgeous cards! I really like how you use photographic images on the cards – at least they look like photos – and they are beautiful. My fav is the rose – such detail and variation of color. Beautiful! What wonderful and beautiful cards. I especially love the one with the picture of a rose. 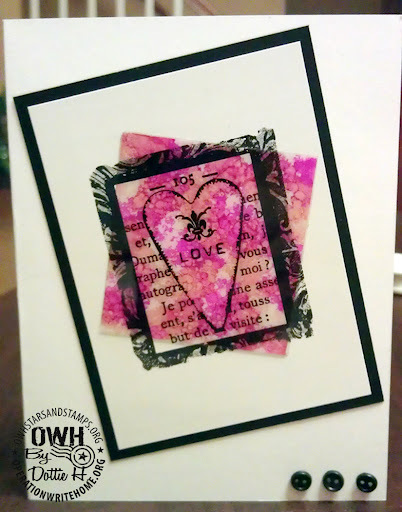 My first OWH card making party was the same one you were at. It was lots of fun and a great bunch of crafty ladies. Thanks for your support! 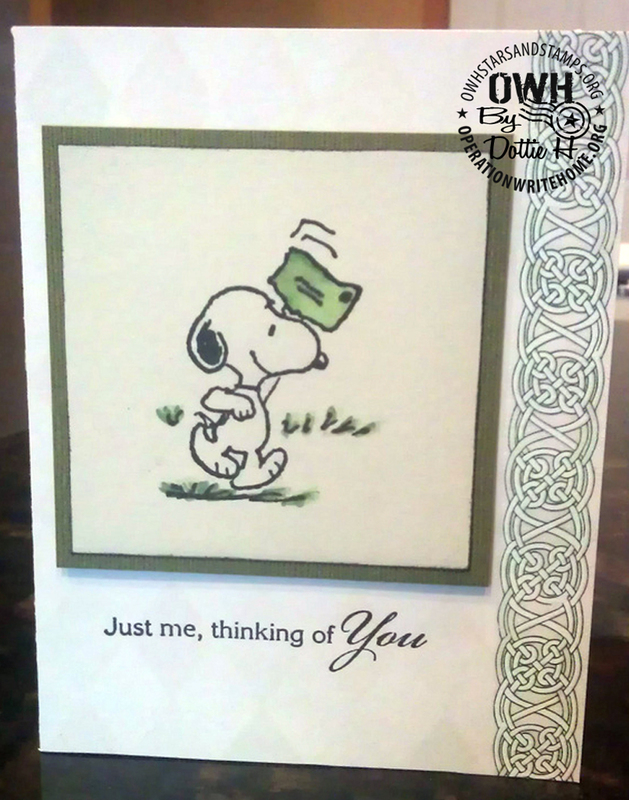 Your snoopy card makes me SMILE! And that last card….oh so lovely. Thanks so much for sharing, Dotti! Dotti, I love all of your cards but the rose stands out for me as I love flowers. Welcome to the OWH team! Well, the heart card took my heart! Your cards are wonderful. Love the variety, from roses to car hoods…that covers a lot!Pat K.
I just love that Snoopy stamp! 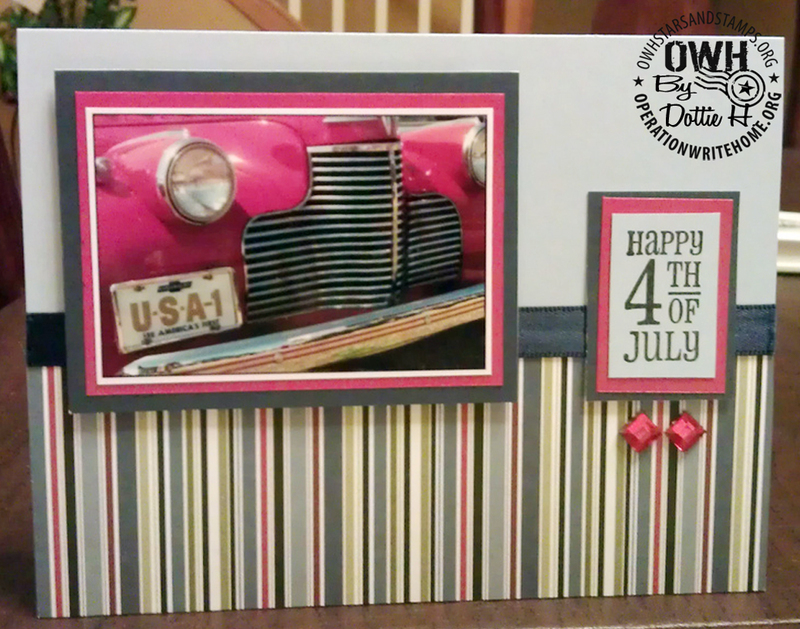 I think it's impossible not to smile at that one) and the 4th ofJuly card is a nice, clean and crisp masculine design. Thanks for letting me share your cards this week Dotti! Beautiful cards! Welcome to the blog team! Thanks for serving on the board. Great cards. I love the way you incorporated photos into your cards. I want to try to do that too but need to use up other supplies before I start printing some of my photos. The car card is great. Beautiful cards, Dotti! And congrats on joining the team! Can't wait to see more of your awesome cards! Love your cards, Dotti; they're a really nice variety of styles and color combos. The first heart one really caught my eye with it's bold colors and the rectangles in different directions – really beautiful! So glad to have you on board, literally, with OWH – congratulations! Dotti, your cards are just gorgeous! !What a great variety! 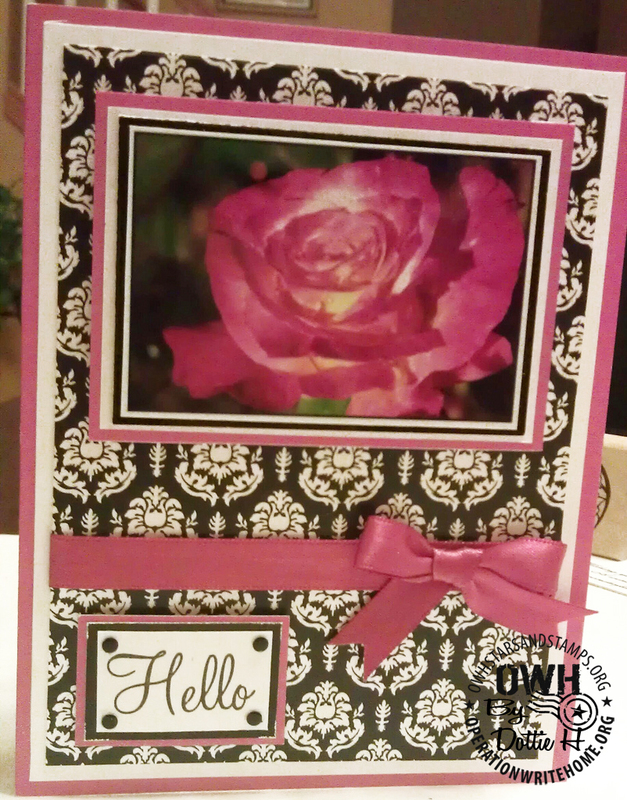 Your rose card is absolutely stunning!I'm glad you're part of the OWH team! !